Welcome to Packman's "Southern Fried Football"! Packman is in the process of loading up on another year of Southern Fried Football™. 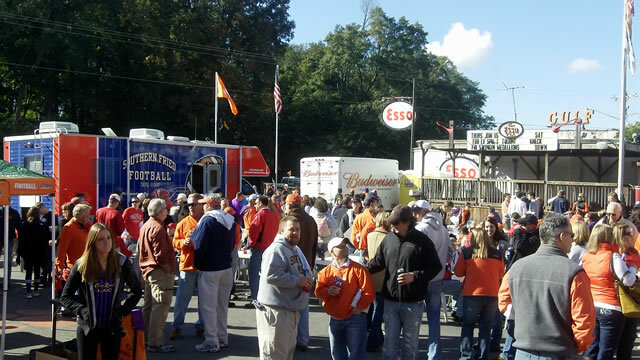 Whether it's the Tour, the radio shows or the website, college football fans in the South know how to have a good time. 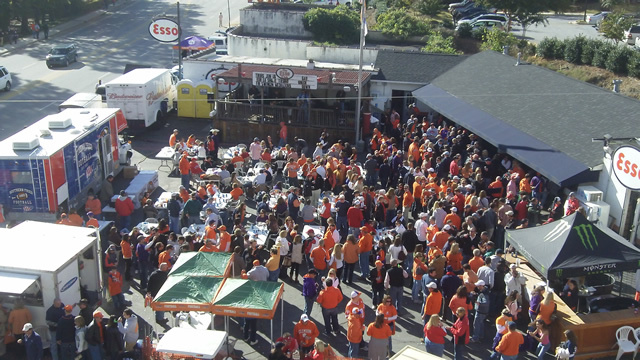 Nobody does it better than Southern Fried Football™ fans. The tailgating, the pageantry, the bands and of course the football....put it all together and you get "Southern Fried Football"™. Later this year, Packman will announce his 2013 Southern Fried Football™ edition on his radio show on SiriusXM 91 College Sports Nation, and on his weekly appearances on the nationally syndicated John Boy & Billy Show. As we countdown the days until the big announcement about Southern Fried Football™ 2013....enjoy all the info and stats about your favorite college football teams and check out some of the Babes pages from past Southern Fried Football™ Tours. We scout for the finest talent in the South every week on the Tour, and post it here. 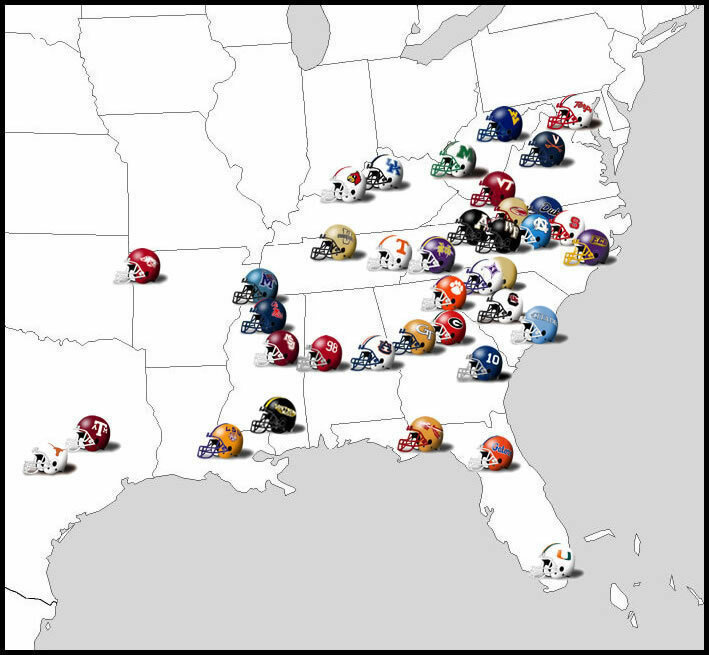 The history of all teams on the Southern Fried Football™ Tour. Click on your favorite team below to open its official football site in a new window! Southern Fried Football™ is a registered trademark of Mark Packer. It is hereby recognized that any individual or organization employing the phrase "Southern Fried Football"™ in any public medium - including (but not limited to) print, radio, tv or the internet - without prior approval from Packman is willfully engaged in breaking the law! Trademark and copyright infringements are very serious offenses, and violators will be prosecuted to the fullest possible extent. Anyone who suspects that "Southern Fried Football"™ is being used in any way, shape, or form without proper authorization should contact Packman via e-mail. In the Fall of 1997, Packman coined the phrase "Southern Fried Football"™ on >his daily radio show. He liked the idea so much, he decided to trademark the name and created a company under the same title. 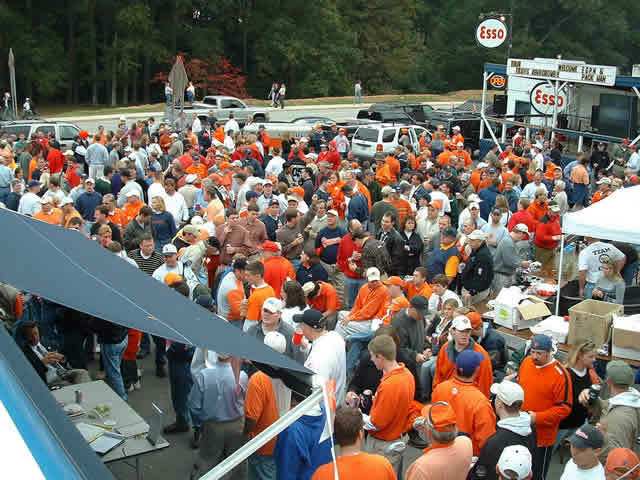 On May 2, 2000, the mark "Southern Fried Football"™ was published in the Official Trademark Gazette. 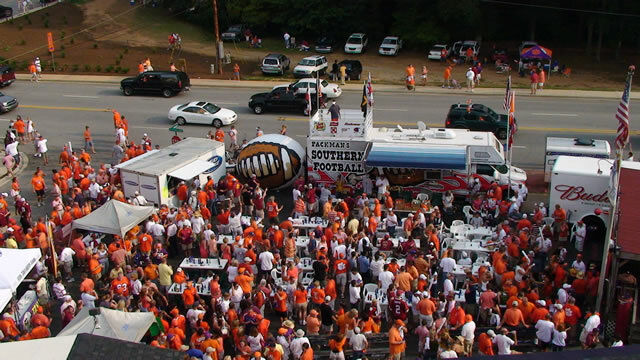 On July 25, 2000, the mark "Southern Fried Football"™ became the sole property of Mark Packer. A Certificate of Registration presented by the United States Patent and Trademark Office was presented to the Packman, and the term "Southern Fried Football"™ was officially born. Southern Fried Football™ is now exclusively owned by the Packman for radio and tv services, printed materials, merchandise, the Tour, and much more. Anybody that uses this phrase without permission by Mark Packer is breaking the law...and anybody found using the mark without consent will be prosecuted to the fullest. "Southern Fried Football"™ is trademarked by the U.S. Trademark/Service Mark Registration #2,370,280. 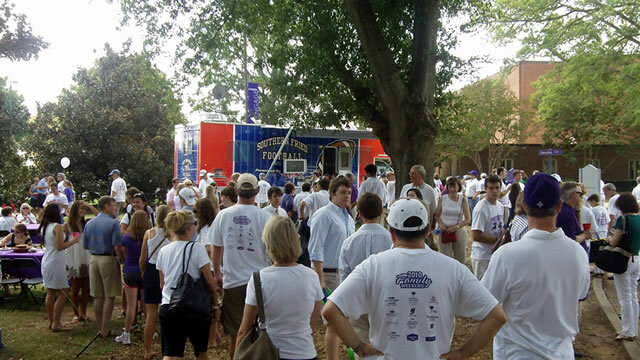 "Southern Fried Football"™ logo was trademarked on September 27, 2006 under the registration number #3,141,915. As we always tell you....It ain't a big game until we get there!